This group of free spring printables will help you decorate your home and your life just in time for the season of growth and renewal. You'll find all types of spring decorations here that you can download and print for free. There are paper garlands, art prints, banners, stationery sets, cake and straw toppers, wreaths, pinwheels, and more. Also be sure to check out these free spring clipart, coloring pages, and word search puzzles. Don't forget about the other holidays that happen in spring. For Easter, I have lots of free Easter printables including cards and coloring pages. 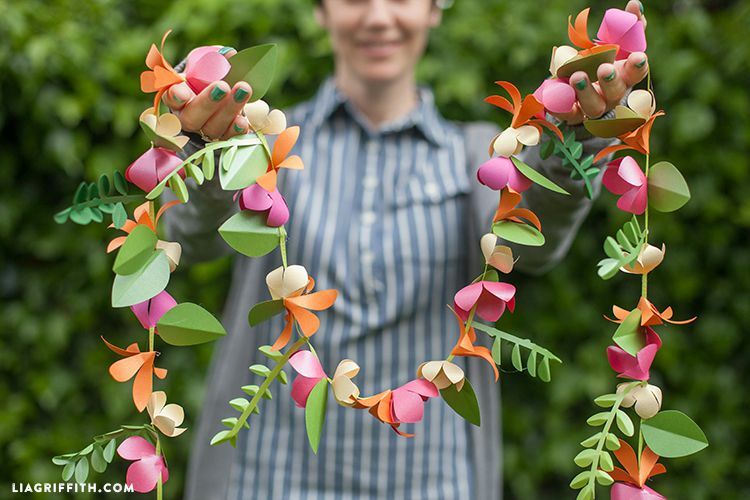 Lia Griffith has designed a lovely spring paper flower garland that provides templates and detail instructions on how to cut, fold, and assemble flowers and leaves to make this stunning garland. You can use whatever paper you have on hand to make the flowers, but metallic cardstock will give you a similar look to what you see in the photo. You can find more details and photos of the spring paper flower garland at Paper, Papers, including a PDF of the leaf and flower templates as well as an SVG file that works with the Silhouette Cameo. 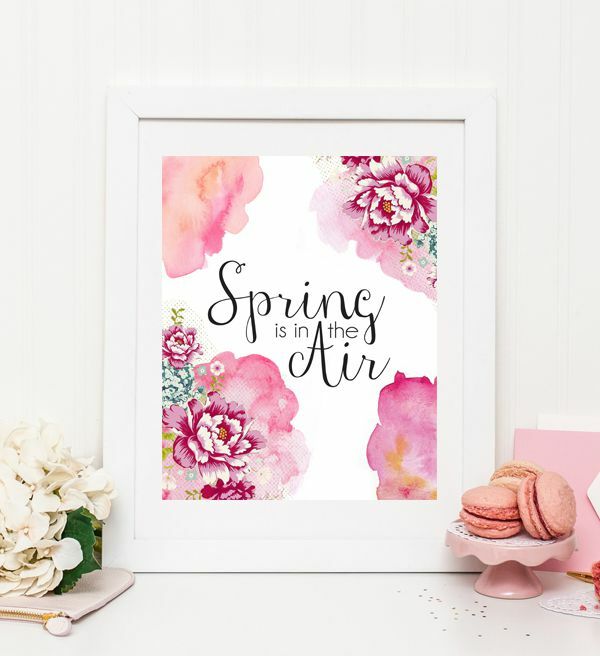 Kristen Duke from Capturing Joy features this "Spring Is in the Air" 8x10 art printable that looks great in a white frame on your mantel, and end table, or even hanging in a bathroom. The white background of the print really sets off the pink peonies and ​watercolor flowers. It can also be used as a Facebook cover photo or spring wallpaper. In addition to the spring print, there's a "He is Risen" print that is similar in design and would be perfect for Easter. These flower printable straw toppers from Made to be a Momma are such a fun addition to a spring get together, or even just a quiet night out on the porch. Download the template of bright pink flowers, print them out on white cardstock, and carefully cut them out. You can then make some simple leaves (here's a template if you need one) and glue them to the bottom edge of the flower. Punch a hole in the middle of the flower and thread a paper straw through them. Beautiful! Paging Supermom has designed this cheerful bloom banner just in time for spring in three shades of pink with colorful flags and bright green leaves. The downloadable template includes the letters to spell out bloom, colorful flags, and green leaves. You'll just need to cut everything out and assemble them using tape and string or mini clothespins and jute twine as shown here. Pizzazzerie has designed these colorful spring flower cup wrappers in orange, yellow, and green, that brighten up any ordinary plastic cup. The template downloads these spring wrappers two per page that you can quickly print and cut out. Use scotch tape to secure them around the plastic cups, and you're ready to show them off. Nothing quite says spring like pinwheels. They remind us of our childhood and are just downright pretty to look at. These printable spring pinwheels from Yellow Bliss Road checks both those boxes. The printable pinwheels are available in two sizes, large and mini, and are decorated with purple, pink, and yellow stripes and polka dots. You'll need to cut them out and follow the simple assembly directions. You'll need a ​small hole punch and some ​brads to make sure they stay secure. Also included are a matching Happy Spring and Happy Easter banner to go along with your pinwheels. "The Earth Laughs in Flowers" states this pretty free Spring printable decoration from Ella Claire. Beautiful watercolor flowers surround the world with this lovely quote in the middle. It's going to look great anywhere in your home, even in the kitchen on a clipboard like shown here. You can open this free spring art as a PDF file and then print it out on cardstock as an 8x10 print. These stunning paper Camellia blooms from Lia Griffith look great as a garland, in a vase, or as a gift topper. Use the template over at Paper, Papers to print out the templates that you can trace on your favorite colored or scrapbook paper. Use a hot glue gun and paper-covered floral wire to assemble. The result is truly breathtaking. The Lily Pad Cottage has two free gardening art printables that would be perfect for spring. One features a trio of gardening tools and the other a watering can. Each has a quote that will inspire you to get out and enjoy the season. You'll need to scroll down to the very bottom of the post to get the free, printable 8x10 download for each of the gardening art printables. One of the little enjoyments of everyday life is using some really pretty stationery. Kiki and Company have designed these free Mom and Me stationery sets that fit the bill. There are two different designs of stationery sets here, the black and white striped floral one shown here, and an equally beautiful black and white striped design with a gold heart. Each free stationery set includes cards, envelope liners, and stickers. These floral polka dot bows by Chicfetti Weddings can be perfectly placed on not only gifts but just about anything in your home that needs a bit of brightness. You can print these paper bows in pink, coral, purple, or blue. Complete assembly instructions are included, and they're way easier to put together than you would think. Note: You'll need to share this project on social media to be able to download it. These free, printable planning calendars from A Piece of Rainbow will not only help you plan your spring garden, but they're so pretty that you can hang them up and use them as a spring decoration. You can use this spring planting calendar as ​a reminder of when to plant, to record when you planted, and as a record of when you got the best harvest based on plant time. If you're a gardener, be sure to check out how to get free seeds and 50+ free seed catalogs you can request by mail. Up to Date Interiors has created this beautiful woodland butterfly spring wreath that really brings the outdoors in for this season of regrowth. Cut out some paper butterflies (like the lovely ones at What a Beautiful Mess) and glue them onto a ​grapevine wreath. You can change the whole look of the wreath by adding just a few or a whole kaleidoscope of butterflies.